WSPA’s global disaster management team is monitoring the situation in the Pacific region as the Japan earthquake of today triggers a massive tsunami. Staff from both the WSPA Central America office and the WSPA Asia office are poised to respond to animal need as events unfold across this region, including in some of the most vulnerable island states. 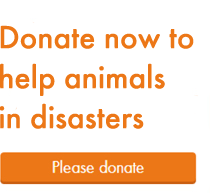 Considering the scale of the disaster and the impacts on human populations, it is inevitable that there will be concomitant risks to animal welfare too. Regarding the situation in Japan, we have already been in contact with our member society, the Japan Animal Welfare Society who are on the ground and can provide us with the most accurate information. We have also been in touch with the OIE in Japan to find out what the official response plans are, and to offer our technical assistance and our experience from the Asian tsunami of 2004. The risk to the nuclear facility presents a grave concern for people and animals in Japan, and will be one of the factors informing our decisions – as it will most other aid efforts – to send teams into Japan, so we are keeping a close eye on information about this. We will keep this page updated with all the new information we get so do check back regularly.